प्रशंसकों के पसंद: 1. Bad Reputation. Do आप ship St Berry? प्रशंसकों के पसंद: St Berry >>> any other Rachel ship. That is all. प्रशंसकों के पसंद: "J: Have आप still got my carebear? R: Yes J: *sighs in relief*"
I couldn't post it on the link section because the यू. आर्. एल was inaccessible, but I couldn't help but share this witty and humorous review. [i]"Definitely the most versatile guest तारा, स्टार on Glee. While Hair was quite good at playing straight, Hair was even better in its natural state. Jesse coming back to ग्ली one last time (the only way I'll ever watch ग्ली again, lol)! 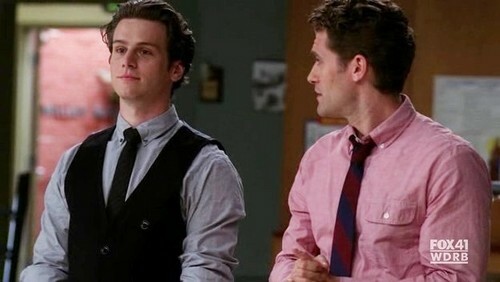 a pop quiz question जोड़ा गया था: S03E21 - Nationals: What's the only vintage thing about Jesse St. James? a pop quiz question जोड़ा गया था: S03E21 - Nationals: When Jesse gets nervous three things happen: he gets mean, he gets really pale and...? a pop quiz question जोड़ा गया था: S03E21 - Nationals: Most people don't realize but Jesse actually लॉस्ट weight during his Bohemian Rhapsody performance. According to him, how many pounds did he loose? a pop quiz question जोड़ा गया था: TRUE या FALSE: Jesse St. James once coached Vocal Adrenaline. In “The Power of Madonna” (S02E15), it’s कहा that Jesse moved in with his uncle. But where were his parents?